Increase meeting room revenue by selling live meeting room and services on-line. 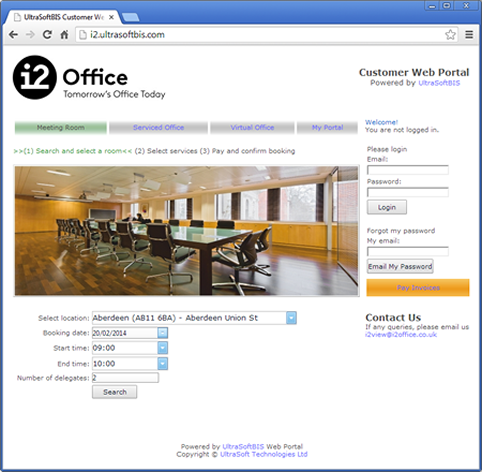 With UltraSoft web portal and API module offer your customers live meeting room booking facility on-line on your web site or via any 3rd party meeting room brokers. Establish your own customer portal. Offer live meeting room booking on-line. Deliver live customer care on-line. Allow customers view invoices on-line. Receive web enquiries directly in CRM. Sell meeting room only via broker's sites. Integrate with 3rd part websites.